Maple Leaf Adventures specializes in cruises to the islands and inlets of western Canada's province of British Columbia and southeast Alaska. From April through October, four- to 10-night cruises focus on the culture of Haida Gwaii (Queen Charlotte Islands), the Great Bear Rainforest (home of the spirit bear, a subspecies of black bear with white fur), Gulf Islands National Park (near Victoria) or Alaska's southern coastal islands and Inside Passage. The company has been operating its ecotours in British Columbia and Alaska since 1986, promoting responsible tourism before it became fashionable. Maple Leaf pioneered tourism in the Great Bear Rainforest in the 1990s and, more recently, trips to northwestern Vancouver Island. Brian Falconer (who, along with Susan Tweedie, restored the schooner Maple Leaf) partnered with Erin Nyhan from 1986 to 2001 to operate Maple Leaf Adventures, specializing in First Nations culture and natural history. Since 2001, Kevin Smith has been the company's president. Smith, who is also a captain aboard Maple Leaf, strives to help protect remote places along the coast where he sails. Onboard MV Swell, life centers around whale spotting, socializing and, with just 12 passengers oboard, getting to know your fellow adventure seekers. 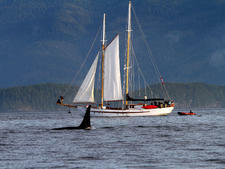 The 92-foot sailing schooner Maple Leaf was built in 1904 in Vancouver, Canada. At the time, it was British Columbia's most expensive coastal yacht. Maple Leaf Adventures focuses on seeking out wildlife, bringing passengers close-up views of humpback whales, sea lions and bears, including Canada's illusive spirit bear. Cruisers have a chance to meet and talk with First Nations people one-on-one, and with just 10 passengers onboard, you'll quickly get to know your fellow shipmates, naturalists and crew. There's an average of one crewmember per two passengers, allowing for highly personalized service and activities. The wheelhouse is usually open for visits with the captain, as well. Whether under sail aboard Maple Leaf or Passing Cloud or under power on MV Swell, you're in for a cozy experience. The vintage ships and cabins are on the small side. On Maple Leaf, two bathrooms are shared among eight passengers and the four cabins are semiprivate, being closed off with a heavy curtain on the hallway side. You'll spend most of your onboard time out on deck or in the enclosed wheelhouse lounge. The sailboat Passing Cloud has four cabins, each equipped with a sink. Three forward cabins share a "head" (marine toilet), while the larger aft cabin has a private one. Classic tugboat MV Swell offers five cabins with private facilities and either two single beds or one queen. You can kick back in the tug's enclosed aft lounge or up top in the hot tub. Dining on all ships is around one or two large tables. Fares include wine with dinner, plus a limited amount of beer. The rhythm of the day is similar throughout the fleet. Following a peaceful sleep (there is no sailing at night), you awake anchored in a wild cove or tranquil bay. You go ashore following breakfast for a morning of bear viewing, exploring a village or a dip in the hot springs. Then you're off to a new location in the afternoon. Generally, there are two or three trips ashore each day, or you might spend time on the water kayaking, exploring by Zodiac, sailing or whale-watching. The minimum four-night cruises are casual, and excursions, entry fees and wine with dinner are included. Active, agile and easygoing nature-lovers are the passengers you'll find onboard. Many are Canadians and Americans with some Australians, Brits, Germans and other Europeans. Ages typically range from 48 to 75, with 60 being the average. Children may travel, but the booking must be made directly with the company and not through a travel agent. Families can charter an entire boat. The small ships and active excursions are not suitable for toddlers or for those who are frail or have physical disabilities. The pride of the fleet is 92-foot Maple Leaf, a schooner built in Vancouver, B.C., in 1904 and beautifully restored from 1980 to 1986. Made of wood and trimmed in brass, it was the first B.C. coastal ship with electric lights. The schooner has five sails, eight bunk beds and two shared bathrooms with showers. Bunks are arranged in four semi-private compartments, each accommodating two persons in a double bed below and a single bed above. One wall of the compartment is a heavy curtain, as in an old-time train sleeper car. 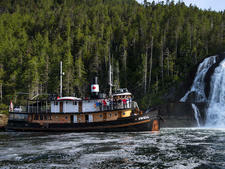 MV Swell, an 88-foot wooden tugboat, was built in 1912 in Vancouver, B.C. It has been beautifully converted -- to the tune of a $3.5 million refit in 2004 -- and accommodates 10 passengers in five private cabins. In addition to these two company-owned vessels, the line charters 70-foot schooner Passing Cloud. It has two masts, a crew of four and carries eight passengers in four private cabins, three with a shared bathroom. It was built in Victoria, B.C., in 1974.